Who said that happily ever after had to end? With the Enchanted Zombie Princess Costume, you can have an eternity with your dream prince! Crafted entirely from fine polyester fabric, this whimsical maiden brings life to the undead. This gruesome dress features a bodice-style torso with the full sleeves and skirt of a fairytale wedding dress, the one gown every princess dreams about! The tattered cloth gives the impression that she has fought long and hard for her love and will continue to do so. 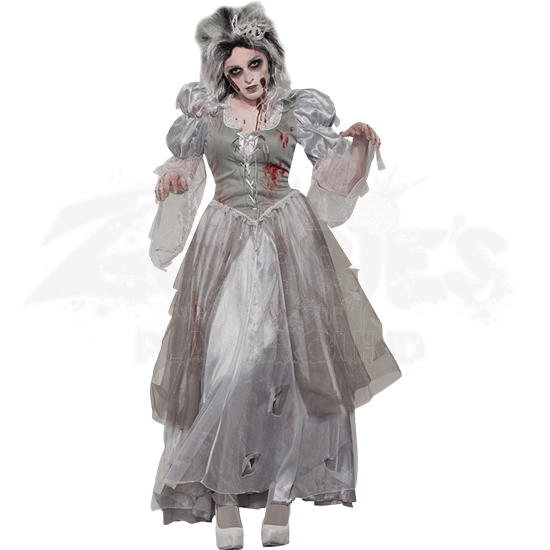 Pair this undead princess dress with the Charming Zombie Prince Costume (FM-78244) for a unique couples costume that is sure to put the common zombie to shame! When it comes to living happily ever after in the afterlife, the Enchanted Zombie Princess Costume cannot be outdone!